Since Monday's update, I've learned a few more things. Snowflake is going live 5-February. (Thanks, E.) Birmingham, Alabama received notification they will go live in the next 4 months, as did Lubbock. (Thanks, C.) If Seattle got their notification as rumored, no one has mentioned it. Here's an updated map. 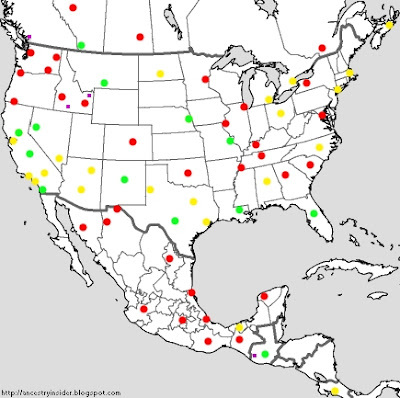 Green is live; yellow, announced; red, not yet; purple, under construction. Notice we now have an unbroken band of states with green and yellow dots from one coast to the other: California, Arizona, New Mexico, Texas, Louisiana, (sorry Miss. ), Alabama and Florida. Those betting that Las Vegas would go live 5-February received enormously disappointing news last week. Their rollout has been delayed with no word on how long the delay might last! (Thanks, F.) I didn't hear if a reason was given, but I think temple-specific delays might be caused by equipment related issues. I wonder if high growth in the Vegas area, coupled with the Temple's location far from the city center could make it difficult to get the high-speed Internet connectivity required by New FamilySearch.